I figured some people do not know how to do this so I will run a simple set of instructions to tell you how to do so. ENSURE THAT RISK OF RAIN 2 IS CLOSED. First of all, you need to navigate to where your steam directory is. Which in my case is the D drive accessed by going to the This PC section. Edit to Notes 1/2: All remaining item codes are given to me by @LethalxCyborgx many thanks. Note 3: If you would like a guide on how to earn them in-game versus editing the document. I will add it per a certain amount of +1s. I earned all of them myself already in-game. NOTE 4: Updated the XML document with all items added + a lunar coin value of 2500. Refer to steps 1 - 5 on the first set of instructions. Save the document and then close it, once you load up a singleplayer match, you should now have x amount of lunar coins. I got the game illegally and I don't seem to find the .xml no where..
You probably should not have done that. However do you know the directory in which it was installed? Could you post a screenshot of your folder? Is this right? I didn't dare to modify it yet. 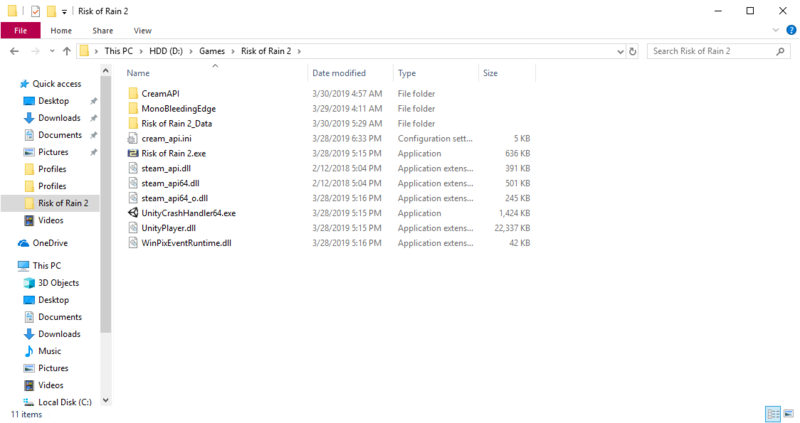 Check the Risk of Rain 2_Data folder for a document. Nice! Yeah everything in this game can be modified via the xml document provided in your folder. So don't feel unsafe about editing something. All you have to do when you want to edit a value is save the original document and paste it in another folder so you can try the new document you edited. Obviously if that does not work, then you swap back to the original file. Thanks for checking that out. I have not had time to look at it again. Bandit doesn't show up in game lobby doe. Yeah I am not sure. Either A, bandit is a class name for commando (Have not checked the .listing to see if commando is a listing) or B they are working on him and his data value is there. EDIT: Just checked and the commando value is there yet not displayed. So bandit may just be the next character they are working on.